Made of solid cast brass & brass tubing. Comes with a velvet lined carrying case. 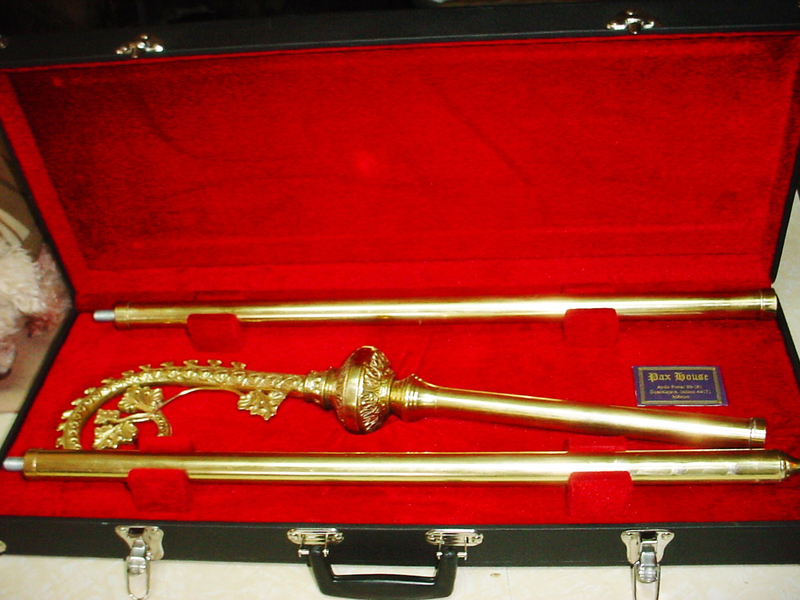 This crosier is a copy of an antique which we made from the original. Comes apart in 3 sections for easy travel as shown in the photos. 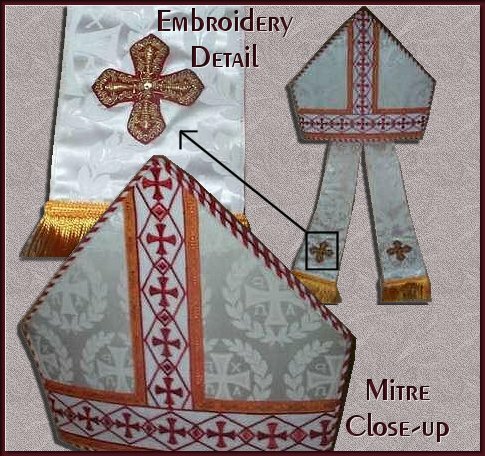 Made of a cotton blend with an embroidered cross in the center. trimmed in imported galloons and piping, lined in red satin. Measures 32" x 17" Has cotton tie cords in two corners. 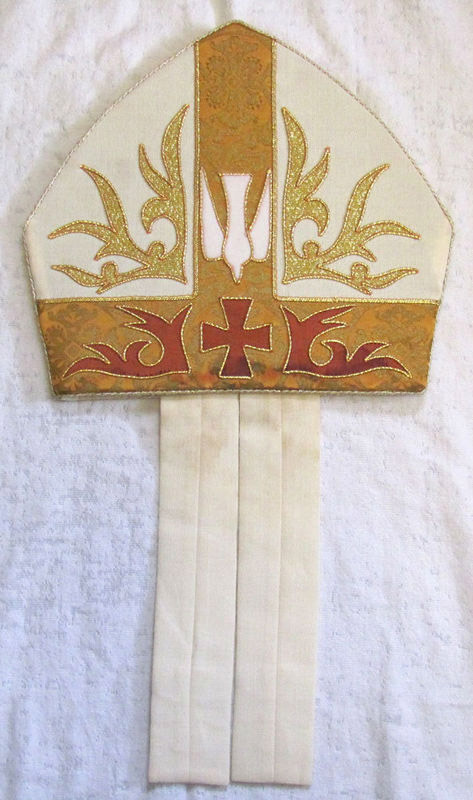 Used for special religious ceremonies by the bishop. .
A rare item to find any where. 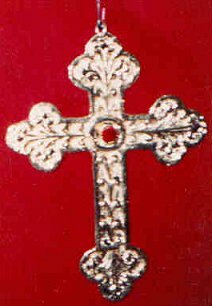 This is our Byzantine style cross set with five genuine semiprecious jewels. 5"x 3" comes with presentation box. Solid cast brass, design on both sides. 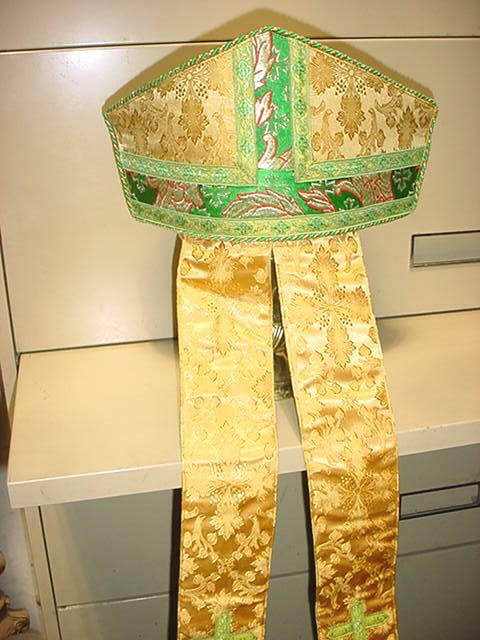 Used by a bishop for High Mass, this set is ALL brass, beautifully hand chased. 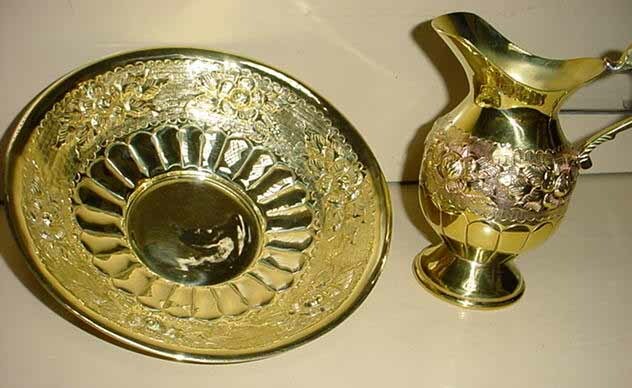 Basin is 8 1/2" diameter, the ewer is 6" all. $150 for brass or nickel finish. 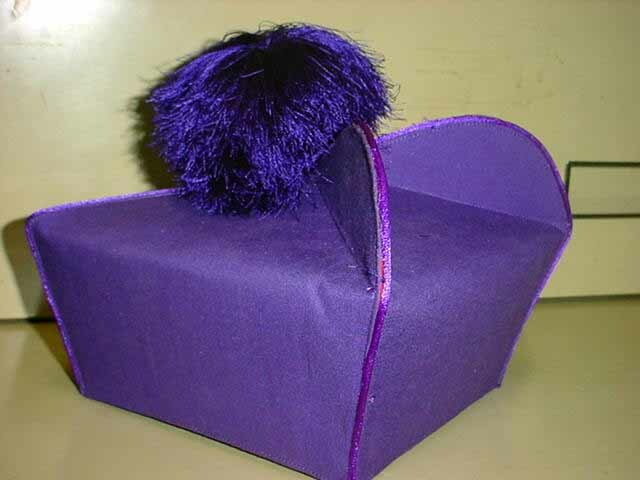 These are available in black for priets, black with red or purple piping, all fuchsia or all purple. 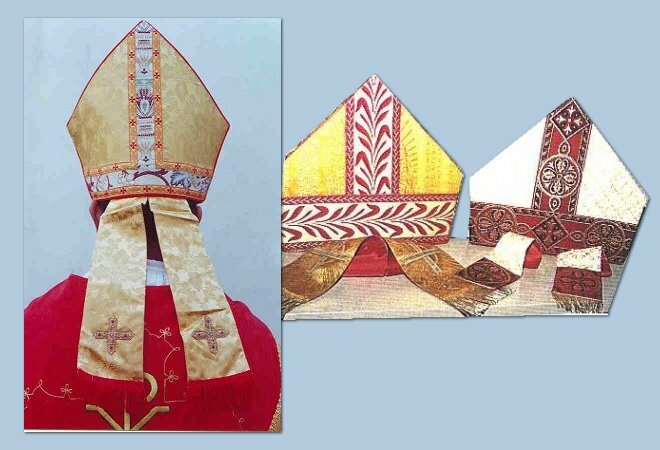 Also RED watered silk for cardinals. 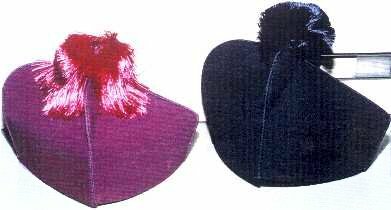 All birettas have a pompom on top, except the cardinal's. 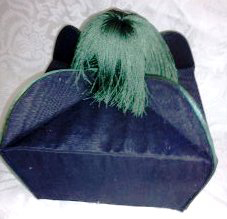 A pompom will be provided on a red cardinal's biretta upon request. 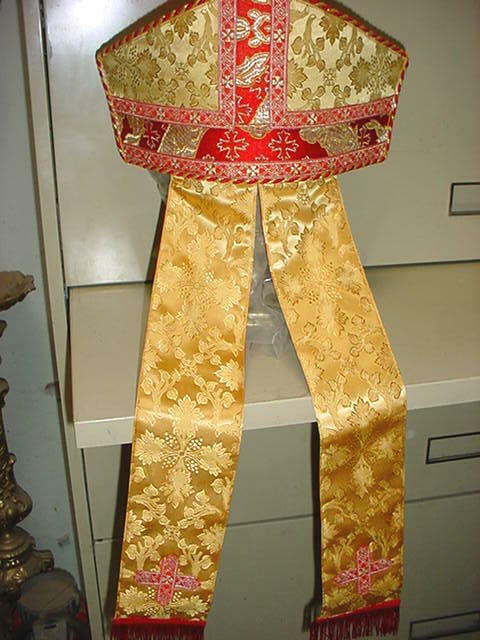 We also make doctorate birettas with four corners in any color. Tell us your HEAD size circumference in inches. 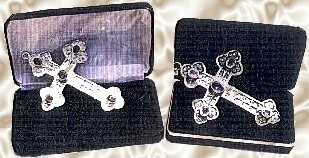 Licentiate is an academic degree conferred by universities for studies in Theology, Philosophy, Scripture, or Canon Law. 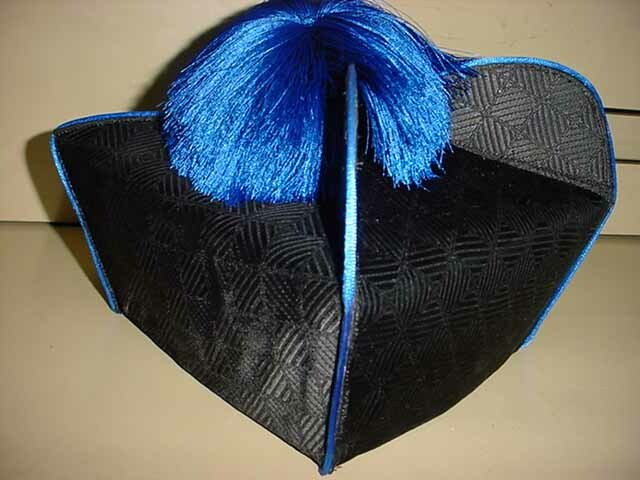 Made of plain black material with blue pompom & piping. Tell us your head size circumference in inches. 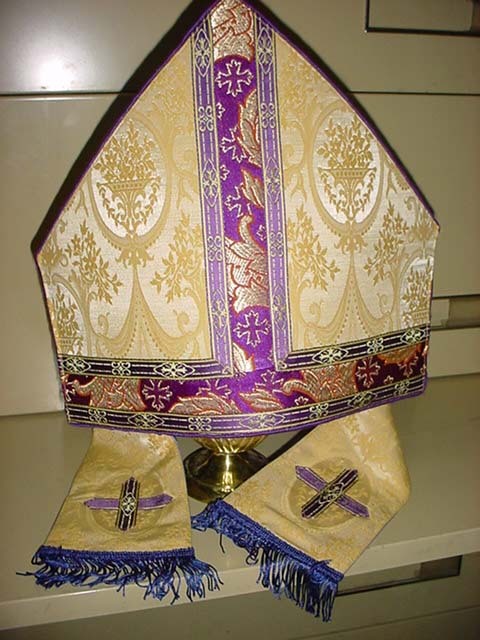 Anglican bishop's biretta with dark violet material, pompom & piping. Licentiate is an academic degree conferred by universities for studies in Theology, Philosophy, Scripture, or Canon Law. Made of plain black material with GREEN pompom & piping. This one has FOUR corners or horns. Tell us your head size circumference in inches, not your hat size. 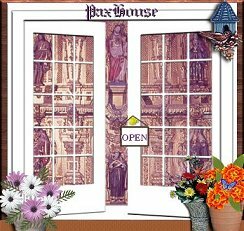 This is a new design we make for use during LENT. 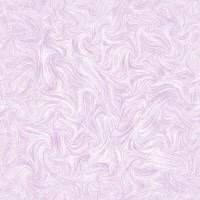 The motif violet & gold banding on a white or gold brocade. Also available in other colors. Just let us know the color you would like. We make these only to order. Be sure to provide your head size circumference in inches to the nearest 1/4". (not your hat size). 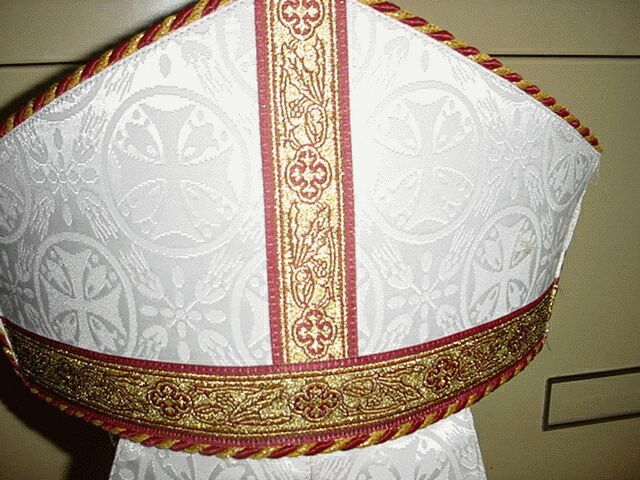 Nobody makes mitres lilke we do. The quality goes in before the name goes on! 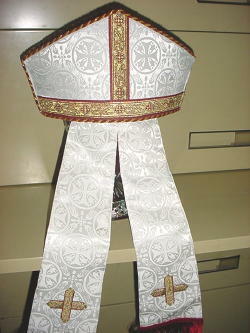 This is a new design we make all by hand sewn. 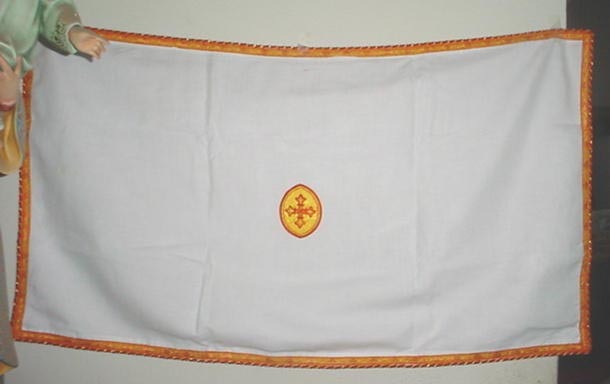 The motif of the Holy Ghost with fire is available in many different colors. Just let us know the color you would like. We make these only to order. Be sure to provide your head size circumference in inches to the nearest 1/4". 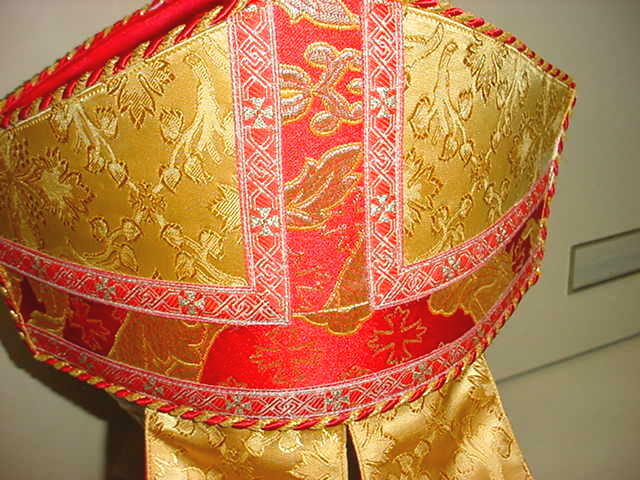 Lined in red satin, French galoons, Coronation tapestry orphery banding. 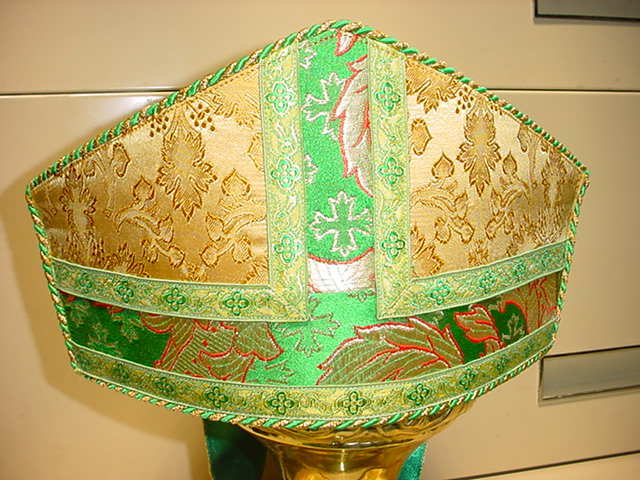 Traditional brocade Medieval or Anglican style mitre. Stands 6" tall. Provide circumference in inches of the head size you want it to fit. Available in ALL colors. Available in Red, green, or purple. 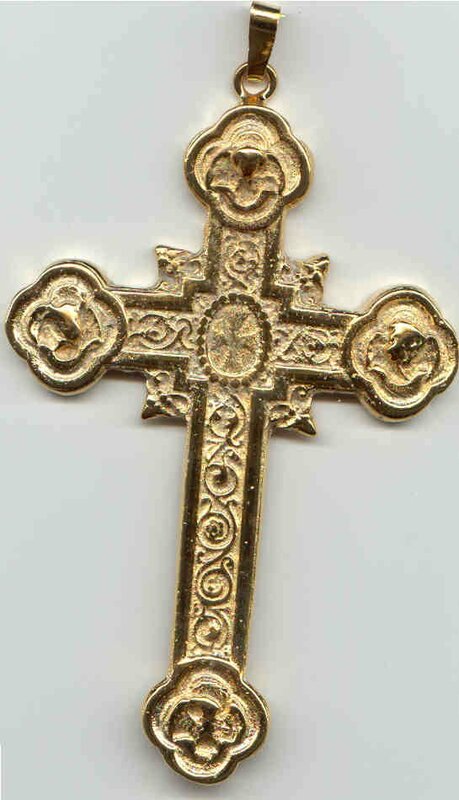 Alos available in Black-Gold for monastic abbots & Archabbots. 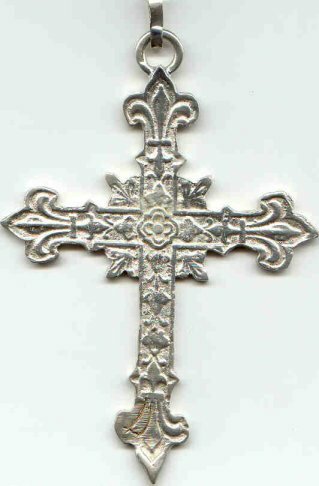 Comes with hook for cross. These identical cords sell elsewhere for over $100. 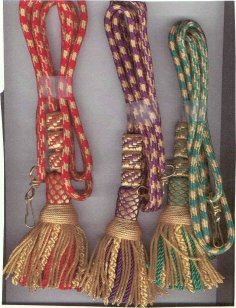 Available in ALL GOLD cord also. 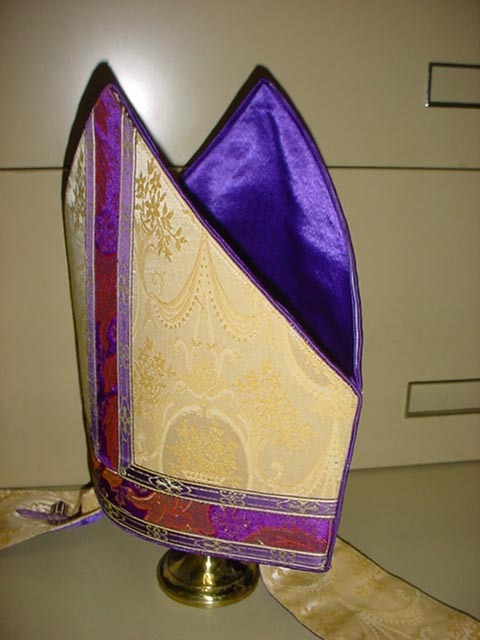 New traditional bishop mitres of beautiful brocades available in many colors. This is only one example of our many beautiful designs. 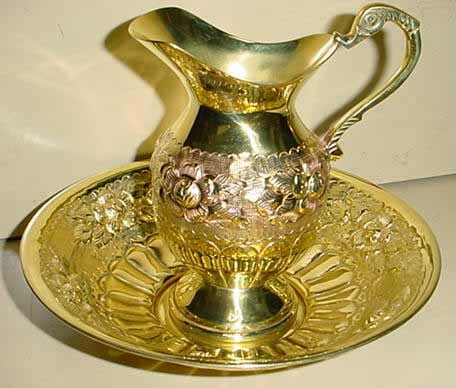 Cast brass, gold or silver plated.